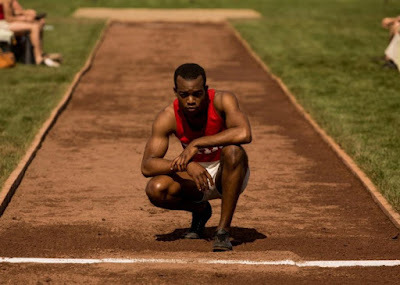 The first time we see Jesse Owens (Stephan James) running on the track, he tosses off a world class time, causing his coach at Ohio State University, Larry Snyder (Jason Sudeikis), to bewilderingly remark that his young charge has the kind of talent to win Gold Medals in Berlin. 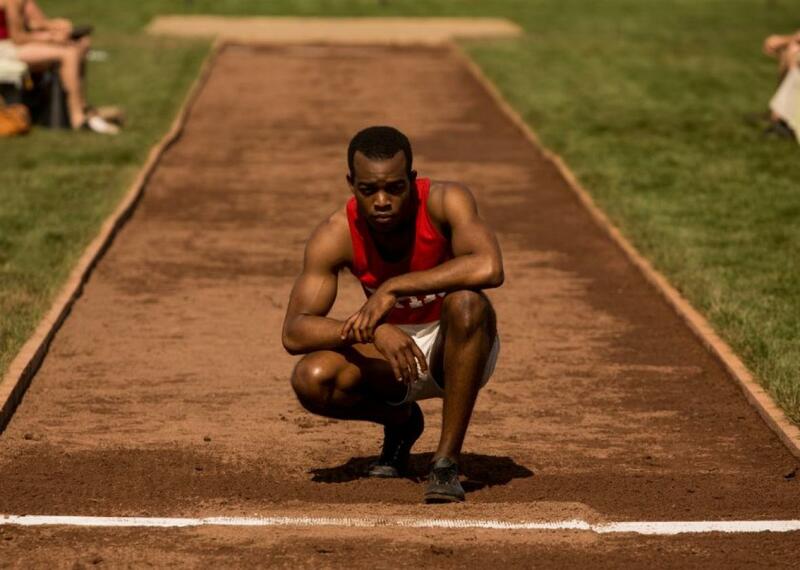 And that swiftly our society’s relationship to Jesse Owens, the same relationship director Stephen Hopkins’ “Race” has with him – that is, for all of Owens’ magnificent accomplishments, like the time he set three world records in under an hour, bouncily recounted in “Race”, everything comes back to the 1936 Berlin Summer Olympics and Owens’ feats of strength in sticking it to the Nazis. 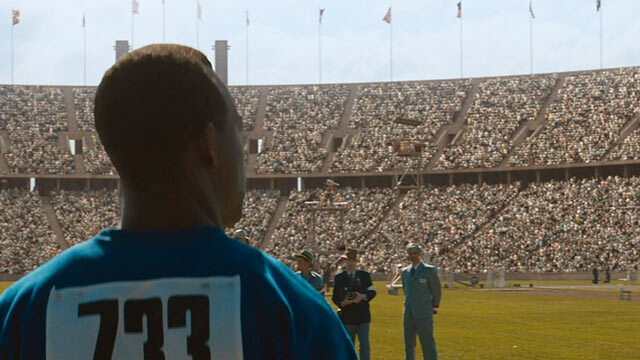 Indeed, “Race” limits its viewpoint to the three years of Owens’ life that led up to those Olympics, marking Hopkins’ film as something apart from your standard biopic, but also marking it as something less than an actual examination of its main character, who he was and what drove him, notwithstanding his impoverished upbringing and wife and child which are presented in a few distressingly syrupy passages plump with platitudes. There is a feeble attempt to invest the Owens character with some shading in the manner of a relationship with another woman, but this is forced, padding an already stretched run time, and Stephan James’ performance of immense modesty renders it almost unbelievable. This guy’s too good to fall prey to such mish-mash of the heart. From essentially his first moment on the Columbus, Ohio campus, Owens encounters prejudice, and will continue to, as his running exists principally in the context of “Race” not to win races but to refute racism. Sprinting is barely the point. If other films about runners, like “Without Limits”, are about the push & pull of Coach and Runner, here the Runner arrives, more or less, fully formed as a world class athlete. Hopkins gives the occasional racing passages a little oomph with a from-the-ground vantage point, but everything on the track is tied back to Owens place in society. Owens was rather famously apolitical too, which, of course, made him such a convenient cipher in the brewing war between Allies and Axis, and that has allowed him to endure as a symbol long after. In a way, Brundage, in spite of his over-written dialogue, emerges as a more intriguing character, one who so committed to the Olympic ideal that he was willing to let himself be manipulated by those opposed to it in order to ensure its survival. And that, I don't think, is because the writers intended to neglect their black protagonist, but because they didn't quite know how to dramatize their black protagonist's un-politicized struggle. They never go searching for Owens' emotional grounding. 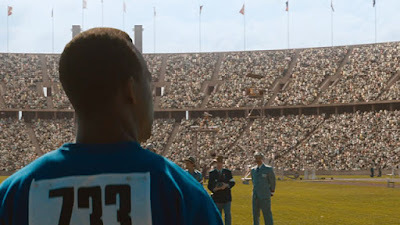 When he is prodded by a member of the NAACP to boycott Berlin on his own and send a message, he gives a brief speech about how on the track, ten seconds at a time, he feels free, which sounds suspiciously like Dom Toretto, and equating Dom Toretto with Jesse freaking Owens is nothing short of an abomination. The closest the film gets to an understanding of Owens' emotional makeup is in his famous Olympic broad jump duel with German Luz Long, where two men bound to opposing ideologies by nationality found themselves joined by the spirit competition. Here, it soars, while elsewhere it too often founders. “Race's” high point is the first time Owens enters the Olympic stadium, a moment which Hopkins captures in a glorious special-effected shot as the camera circles the runner, taking in the seemingly endless roaring crowed, the Zeppelin above, Riefenstahl's cameras following his every move. It's as if in this moment Owens the Runner was co-opted forever by factions of opposing political forces and whatever he did going forward would be tied back to who won in that political war, and that one day they would go on to make movies about him just like this one.